Back in the 1960’s and 70’s us movie lovers didn’t have the CGI laden epic motion pictures that you see nearly every week opening in the local cineplexes nowadays. In fact, back then the success of a science fiction or fantasy movie largely rested on how good the special effects were. Special effects back then was truly an art. Especially stop motion animation which was time consuming and took patience that we attribute to saints. Or the acknowledged master of stop motion animation, Ray Harryhausen. Today, Ray Harryhausen’s films are rightfully acclaimed as masterpieces of the stop motion animation techniques. The classic sword fight between three men and eight skeletons in “Jason and The Argonauts” is regarded as the finest stop motion animation sequence ever committed to film. What makes Mr. Harryhausen’s work even more remarkable is that he did all the stop motion animation in his movies by himself. He never employed assistants until the movie we’re now discussing. Mr. Harryhausen retired after he made CLASH OF THE TITANS and I like to think that he saw the handwriting on the wall and realized that the sophisticated special effects techniques that were being developed by studios such Industrial Light and Magic were being embraced by movie audiences and not his hand crafted stop motion. By the time CLASH OF THE TITANS hit theaters, we’d already seen “Star Wars” and “The Empire Strikes Back” and movie audiences wanted to see movies in futuristic settings and so Mr. Harryhausen’s mythological based movies were no longer popular. But if he had to go out, he did it in style. 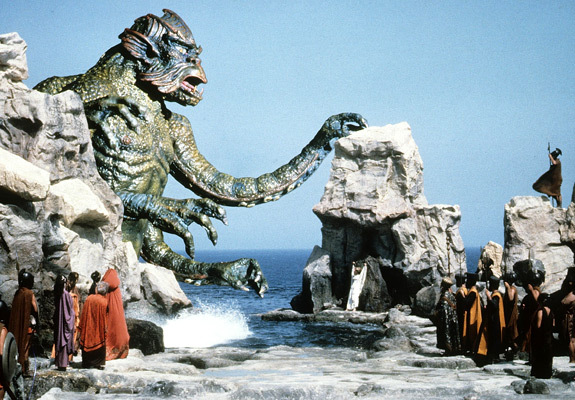 CLASH OF THE TITANS is a retelling of the legend of Perseus, Harryhausen style. As a baby, Perseus and his mother Danae are thrown into the sea locked inside of a wooden ark by his grandfather, King Acrisius of Argos. Turns out Acrisius has made a really bad call here as Danae was impregnated by none other than The King of The Gods, Zeus (Laurence Olivier) himself. Zeus doesn’t take kindly to his baby mama and his son being treated in such a manner and orders Poseidon (Jack Gwillim) to release the last of The Titans: a fearsome creature of tremendous rage and power called The Kraken. The Kraken destroys Argos, the kingdom of Acrisius while Perseus and his mother are brought to a safe shore where Perseus grows up to become Harry Hamlin. And here’s where we get to the best part of the movie; where the gods of Olympus start meddling in mortal affairs. The goddess Thetis (Maggie Smith) in revenge for Zeus transforming her handsome son Calibos (Neil McCarthy) into a hideous man-beast dumps Perseus half a world away in the kingdom of Joppa. But to be fair to Zeus, Calibos did almost kill all of Zeus’ entire herd of winged stallions with only Pegasus escaping. Perseus catches just a glimpse of the supernaturally beautiful Princess Andromeda of Joppa (Judi Bowker) and vows to marry her. But because of a curse laid on Andromeda by her would-be suitor Calibos, Perseus has to first solve a riddle or be burned at the stake. With the help of his new found friend, the playwright/poet Ammon (Burgess Meredith) a helmet of invisibility and the winged Pegasus, he manages to find the answer to the riddle and that only makes things worse. See, he had to cut off the hand of Calibos to do so and that really pisses off Thetis who demands the life of Andromeda in thirty days or The Kraken will be released to destroy the kingdom of Joppa. And so Perseus sets forth on a quest to find the only thing on Earth capable of destroying The Kraken: the head of Medusa the Gorgon which can turn anyone or anything who looks upon it into unliving stone. I oughta say up front that I have no patience with those CGI junkies who refuse to watch a Ray Harryhausen movie because the special effects are ‘cheesy’ and the stories are ‘corny’. The special effects of a Ray Harryhausen movie are nothing less than a true labor of love of a master who gave up time he could have been spending with his family and friends to provide the world with entertainment and I for one appreciate it. Is CLASH OF THE TITANS his best work? Well, to be honest, no. But it is a whole lot of fun if you approach it in the right way and watch it the way it should be seen: on a Saturday afternoon with a whole lot of snacks and friends. Laurence Olivier has a great deal of fun playing Zeus and his “Release The Kraken!” line is one delivered with a gusto that you can only get from Shakespearean actors playing Greek gods. Claire Bloom almost fades into the background as Hera and while the idea of casting Ursula Andress as Aphrodite, Goddess of Love is an inspired one, she is given nothing to do with the role. Maggie Smith as Thetis is the real opponent to Zeus in the movie as she tries to thwart Perseus at every turn. Which leads me to my major problem with the movie: Perseus really isn’t much of a hero. He’s got all the breaks right from birth. He’s the son of Zeus, which makes him half-god. He’s handsome and he’s given magical weapons to accomplish all of his deeds. Weapons which he treats with utter carelessness and either loses or is destroyed. There really isn’t anything Perseus does to deserve being the hero outside of the fact he happened to have the right daddy. So should you see CLASH OF THE TITANS? By all means, yes. If you call yourself a movie fan then you should have already seen this movie and if you haven’t, put it on your Netflix queue or wait for it to show up on Tuner Classic Movies. Ignore the annoying metal owl Bubo and the plastic acting of Judi Bowker and just take the movie for what it is and you’ll have a good time. Enjoy. Anyone familiar with Derrick’s body of work would not accuse him of having “zero creativity”. Derrick is a fantastic author–one of the best working today..
Oh, and btw, the comment about the metal owl being annoying, was annoying, superficial, arrogant and indictative of someone with zero creativity. Get over yourself. I will certainly try my best to get over myself but Lord, it’s so hard to be humble when you’re me. THis killed nothing, and if you think so, then you are too mired in your view of your favorites, and likely you have zero creativity, to just allow what the movie intent was, to be entertained. A movie doesn’t have to have a full on deep plot or amazing special effects though this one did, to do what it intended to. I think far too many people are out to nit pick and otherwise ‘try’ to bring down the attempt of rival movies. I am as picky as the next person, appreciate good acting and effects and decent plot twists, and I had no trouble with any of the above. If you did, maybe movies aren’t for you, and a good book on a cold november night are better served for you. The only thing that I can get from your comment is that you must not have read my review completely or misunderstood the tone of it. if so, I apologize for not making myself clear. 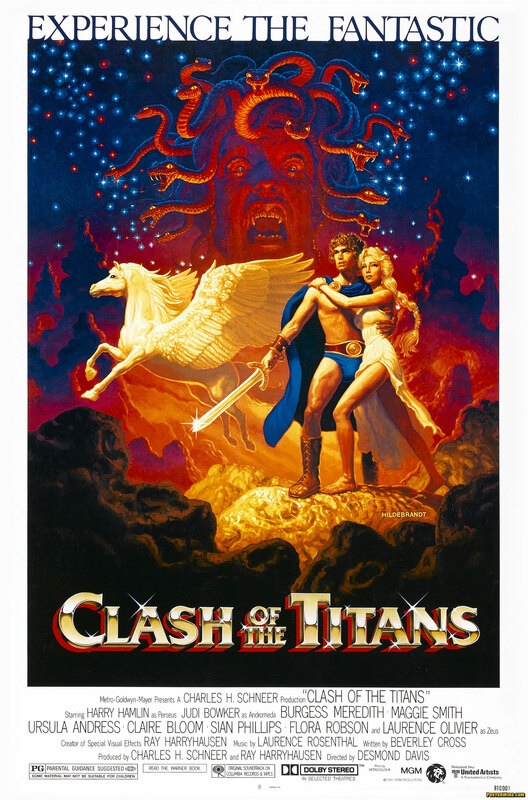 I thought I was obvious in my love and appreciation for the 1981 CLASH OF THE TITANS which I saw during it’s original theatrical run two or three times and have owned both on VHS and now on DVD. I have no problem with a movie whose sole purpose is to entertain. However, it seems that nowadays people equate being entertained with not having to think about what they’re watching. That’s not me. This was a classic. I felt the remake killed this version! C’mon you can’t ignore BUBO! He is the hero of the movie because he gets Medusa’s head out of the sea when Perseus loses it!